On Saturday 29th October Peterborough Diocese partnered with World Vision as part of the HOPE Revolution mission to reach out to young people across the Peterborough area. 440 young people and youth leaders from across the Diocese (and beyond) gathered for an amazing fun-packed evening. The Kingsgate Church and Conference Centre was full of activities for the young people to engage with… a Silent Disco, Cage Football, Surf Simulator, Bungee Run, a giant Cinderella Pumpkin carriage, Gladiator Challenge and much more. The crowd were hugely blessed by an inspiring acoustic set by top Christian band ‘Daughters of Davis’ who played in the Live Music Café. J Marie (from the BBC programme ‘The Voice’) opened the main stage event with her version of ‘You Got The Love’, and then the rest of the evening was a brilliant blur of glow sticks, games and guest speakers including Tim Pilkington (CEO of World Vision) and Phil Timson (National Director of HOPE Revolution). Lou Fellingham and the Embrace Worship Band led the young people in worship, while dozens of young people responded to a Gospel message. There was an opportunity to pray and reflect on the key theme for the evening, the plight of the millions of refugees that are suffering in so many places around the world. 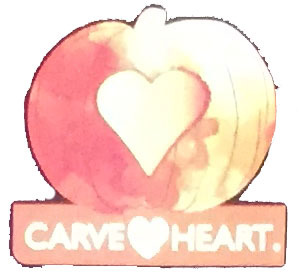 World Vision had advertised the ‘Carve a Heart’ campaign on every one of the millions of pumpkins sold in Tesco stores in the UK this year. The challenge was to carve a heart into pumpkins, rather than a scary face, as a sign of “turning a night of fear into a night of hope”. The hundreds of young people, from very many different backgrounds and Church denominations, really engaged with the event and in doing so connected with God in a way that many had never done so before. This event marked the start of 3 years of events and activities for young people in the Peterborough area, as part of the HOPE 2018 national vision for mission that was launched at Lambeth Palace by Archbishop Justin a few weeks ago. Contact Chad Chadwick (Youth Missioner).